Announcing the June Version Update! The next version update is scheduled to land in late June. This update will not only see the climactic conclusions to some of Adoulin's questlines, but also the addition of new high-tier avatar battlefields. In addition, plenty of job and ability adjustment in store, along with rank 5 monster rearing, style lock enabled for ranged weapons, and a plethora of other additions and adjustments. Keep a look out for more details as the June version update approaches! I'm totally spoiled from these updates. The following high-tier battlefields will be added. The key items required to participate in these battlefields can be acquired from the following NPCs in exchange for merit points. Spoils are rewarded both for vanquishing the boss and clearing the battlefield, and include items needed for reforging artifact and relic armor in addition to equipment unique to each battlefield. Oooh. Cool I now have a reason to do Waking the Beast! Will they be adding a warp point by Fenrir? That would make my day. Every single BCNM area with a hard-mode battle added to it has had a home point placed outside of it so far, so I imagine Full Moon Fountain won't be an exception. That's specifically why I'm hoping for it. It's a pain having to run through that zone to get to Fenrir. I'm slightly surprised that Waking Dreams already has one here, but then, that's used for CoP missions, too, where Full Moon Fountain isn't. Would shave about 8 minutes off my daily routine. Monster rearing will undergo the following changes. Rank 5 monster rearing will be made available. Two new kinds of rearable creatures will be added. New Chacharoon cheers will be added. It will be possible to raise up to three creatures simultaneously. New items will be made available as creature feed. New fish have been added to the following areas. The probability of increasing one's fishing skill will be increased. The probability of catching fish will be increased when a player's fishing skill is 20 or greater and appropriate bait is used. The maximum time required to reel in a catch will be reduced from 15 seconds to 13 seconds. Moon phases will have a stronger positive effect on fishing results. The "Fisherman's Heart" quest will undergo the following changes. The location of Katsunaga, the quest triggering NPC in Mhaura, will be changed from H-9 to G-10. After completing the quest, speaking to Katsunaga will offer a dialogue option to view a list of every catch caught so far. *This option will only display fish caught since the 2015 June version update. 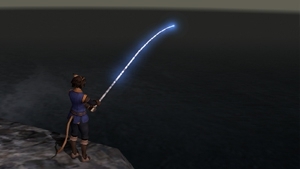 New quests have been added to enhance Lu Shang's Fishing Rod and the Ebisu Fishing Rod. Lu Shang's Fishing Rod quest, "Thanks for All the Fish"
Speak to Jourdenaux in Rabao (G-7) while in possession of Lu Shang's Fishing Rod. *You must have completed Records of Eminence objective First Step Forward in order to proceed with this quest. Ebisu Fishing Rod quest, "Fish Favors the Bold"
Speak to Irmilant in Rabao (G-7) while in possession of the Ebisu Fishing Rod and having fished 100 different types of fish. *Only fish caught since the 2015 June version update will count towards this requirement. Any fish caught before this version update will have to be caught again to begin this quest. *Warning: winning the Ebisu Fishing Rod through Mog Bonanza will flag the quest "Indomitable Spirit," which rewards said rod, as having been completed, preventing the player from experiencing it. 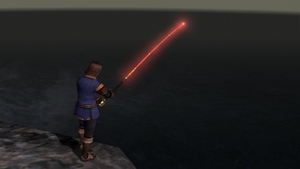 Completing these quests will enhance their respective fishing rods, and bestow them with a special visual effect. New quests will be added. The following quests will have their difficulty adjusted. I [complained] years ago when I got my Ebisu about how, after all the effort required to obtain, it should have looked like a [gorram] lightsaber. The Sith!Ebisu shall be mine. That's pretty cool but is that going to make Lu Shang EX? The only thing it has going for it now is that it's tradable. If they're feeling really generous, the Lu Shang quest will actually give you another (untradeable) rod, but somehow I don't see that happening either. Jobs will undergo the following adjustments. The Footwork job ability will undergo the following adjustments. Footwork will no longer make kicks the primary mode of attack. Instead, autoattacks will also have a chance of kicking while Footwork is in effect. Effect duration will be decreased from 300 seconds to 60 seconds. *The effect footwork has on particular weaponskills will remain unchanged. Six new familiars will be able to be called forth with the "Call Beast" ability. The following job abilities will undergo adjustments. The ability will no longer ignore level difference penalties. Instead, a bonus to ranged accuracy and damage will instead be granted based on the level difference between the target and the player. This ability will now ignore the following effects granted by spells and job abilities. *These changes will only apply to eagle eye shot when used by player characters. Archery and Marksmanship skills will be increased. The activation time for the following breaths abilities will be increased from 1 to 1.25 seconds in order to resolve the issue wherein changing equipment via the equip set function would occasionally not be reflected properly. The following blue magic spells will be added. Automaton HP will be increased. In line with this change, the amount of HP recovered from the Auto-Repair Kit attachment will be slightly increased. The recast delay of Repair will be reduced by 50% and the effects of automaton oils will be adjusted according to the table below. New alter egos will be added. Tenzen and Gadalar's action logic will undergo adjustments. The June version update is right around the corner, but I would like to share an early overview of what will be implemented. Starting off, we’ll be adding high-tier battlefields for three avatars: Fenrir, Carbuncle, and Diabolos, so look forward to challenging enhanced versions of these familiar creatures once more. New notorious monsters will be added to Wanted. With new and bigger foes to vanquish, now's a great time to get involved with Unity! Several Seekers of Adoulin quests will also reach their conclusions this patch, and players will be able to enjoy a bevy of lore, battles, and rewards. Furthermore, we’ll be implementing new aspects to fishing that are geared towards veteran anglers that possess the Ebisu Fishing Rod and Lu Shang’s Fishing Rod. A duo of quests provide upgrades to these two special rods, complete with all-new visual effects. Take on the challenges and reap your just rewards! Mog Gardens will also undergo changes as we unlock rank 5 for monster rearing, which will add new monsters and also increase the number of monsters you can simultaneously rear. We’ll also be making job adjustments, adding new alter egos, implementing an emote for sitting on chairs, setting an NPC that will allow you to check what you’ve fished up, addressing the ranged weapon slot for the lockstyle feature, and much more! I hope you are all looking forward to the June version update, which goes live on Thursday, June 25. Below is a detailed list of features planned for the version update. Keep in mind that this list is still provisional, and any balancing or bug issues we discover during testing may require us to remove an item from the update. Adjustments to the quest "Fisherman's Heart"
Addition of a feature that allows players to check fish that they've caught before. Change coordinates of NPC positions. Key items necessary to progress in some missions will be added to the Curio Vender Moogles' merchandise lists. Adjusting difficulty of "The Gustaberg Tour"
Adjusting difficulty of "The Kuftal Tour"
Addition of hints for "Wrath of the Opo-opos"
Addition of hints for "Wandering Souls"
Creation of new additional monsters. Adjustment of additional monster locations. Making adjustments so experience points can be obtained from enemies called forth by certain notorious monsters. Creation of a system that makes it easier to obtain experience points when in a party. Implementation of a function that adjusts the time it takes for monsters to respawn depending on the situation in the area. Increace the maximum amount of Escha Silt/Escha Beads that can be carried. Creation of High-tier avatar battlefields. Adding mechanic that allows for random notorious monster spawning after vanquishing one. Adjustments to rise in cost of tribulenses. Creation of Monster Rearing Rank 5. Increase number of monsters that can be reared at the same time. Additon of new monsters that can be reared. Addtion of new Chacharoon's Cheers. Creation of new notorious monsters. Addition of Unity: Wanted Battle related objectives. Addition of fishing related objectives. Support for new High-Tier Avatar Battlefields. Support for the quest "Eco-Warrior". Addition of new Home Points. Adjustments to Eagle Eye Shot. Adjustments to activation time for wyvern breaths. Creation of new blue magic. Adjustments to added traits of certain blue magic spells. Adjustments to HP of Automatons. Adjustments to the effects of certain attachments. Creation of new Alter Egos. Adjustment to the way status effect recovery works for healer type Alter Egos. Adjustments to the capabilities of Signal Pearls. Adjustments to the capabilities of Tactics Pearls. Creation of a system for enhancing rewarded equipment. Creation of acquired item table for new monsters that can be reared. Adjustment to skill gain rate. Adjustment to odds of getting a bite. Addition of NPCs that sell items for the ability "Reward." Addition of NPCs that sell attachments. Creation of items for emotes. Addition of items that can be stored. Creation of emote for sitting in a chair. Adjustments to the order in which the selection for doorways are displayed. Creation of text commands for "Ready." Addtion of a command to turn the Name Plate magnification feature on and off during area of effect displays. Addition and removal of categories. All I saw was "Eco warrior". I'm liking that. Maybe I just never found it, but is there a way to turn this feature off entirely? I'm not sure why they felt it was needed, but to me at least, it is nothing but annoyance. The reason it was added, apparently, was to better be able to tell what targets would be hit in the case of using an AoE ability. [dev1274] New Seekers of Adoulin Quests! New quests arrive, bringing two of the diverse storylines in Seekers of Adoulin to a close. The concluding sequel to "A Thirst for the Ages". The climactic conclusion following the mounting drama of "The Weatherspoon Inquisition". I hope this doesn't mean they're going to make an NPC that sells all attachments. In other words, are they going to make attachment crafting obsolete? If they had said "adding a new source of PUP attachments" I would be able to understand that fear, but the way they worded it sounds more like they're just altering what the attachments actually do for BALANCE reasons. I'd guess it more for the annoying ENM ones. Not that I'd put much stock on the craft side, either.